Sapphire Ring Co education section, where we will explain important information on Sapphires and Rubies and the two main differences between a truly Natural Sapphire and a Treated Sapphire which has being chemically enhanced by man. Today almost all sapphires and sapphire jewelry seen online as well as in retail stores which are described as “natural” sapphire's are not. Sadly, with new techniques in treating sapphires and rubies, most will have been enhanced. These “natural” sapphires are usually not accompanied with proper disclosure regarding the treatments that they have undergone. The word “natural” is intended to identify a sapphire crystal that has come from the ground ( not synthetically created). What is most likely to be left out in the full description is the fact that the color and clarity, indicated as "natural", is really not just "natural", in almost all cases the color and clarity of the sapphire will come from various treatments that you may very well not be aware of. Today it’s estimated that 70% of sapphires sold as “natural” have been chemically enhanced and treated. A natural sapphire is a sapphire crystal that has been created in the ground and the color has not been altered chemically or added to by diffusion or cooking the sapphire to extreme temperatures of around 1800 degrees Celsius and then enhanced chemically with treatments such as beryllium. 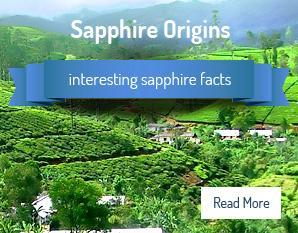 Note: Some natural sapphires can have traces of beryllium in them naturally. The GIA are carrying out extensive testing to see why and how this can occur naturally which we will show with our full laboratories reports if applicable, these sapphires are extremely rare and to date we have left all of these sapphires with the GIA for further education and testing. Treating and heatinga stone is a very involved process that can significantly change the original appearance as well as value of the rough corundum-sapphire that came out of the ground. By using very high temperatures in gas furnaces, these stones are heated for a period of up to 10 days at and above the melting point of the crystal (1800°C). Additives, such as lead glass and coloring agents, can be included in the heating process in order to fill in natural cavities, fissures and cracks in the sapphires. Coloring agents are then diffused into the heating process, and in many cases, the coloring of the sapphire is completely altered. 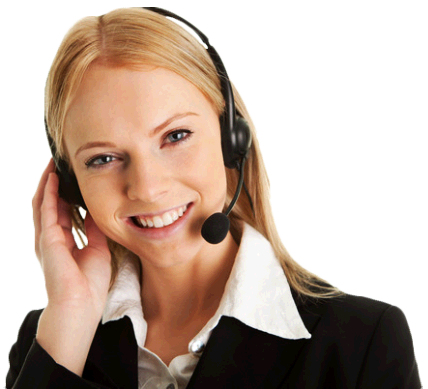 Trying to determine what you are buying is now a scientific research project in most cases and this is why today Sapphire Ring Co uses the Top Gem Laboratories for full gem stone identification and testing. Precious gemstones vary in density, for example when comparing a diamond and a sapphire of the same size, the sapphire will be heavier due to it's larger density. Gemstones are often classified by carats, which is a unit of weight, but for ease of selection and setting, size is a more useful measurement for sapphires, which we list in millimeters (mm). Our standard size for a round sapphire is 6 mm, which is approximately one carat. Download the chart below and print it out for your own reference when selecting size. 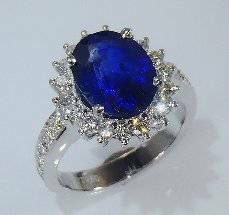 Today it is estimated that around 10 % of natural sapphires are un-heated however for us at Sapphire Ring Co we buy our sapphires before the sapphires leave the island of Sri Lanka as a result today we estimate that 30% of our sapphires are without heat. Our decision when buying any natural sapphire whether the sapphire has no treatment or natural heat only is based purely on that sapphires color followed by clarity and inclusions, almost 80% of a natural sapphires value whether the sapphire has no heat or natural gentle heat is based on the sapphires color, even natural heated sapphires with visible inclusions can be very valuable if the color is in the top rich royal blues,reds,pinks,purple & pure yellow . This might come as a surprise but the cut of a sapphire is less important, today, Sapphire Ring Co will have many of our sapphires re-cut and or re-polish here in the US as well as Sri Lanka depending on the sapphires cut or polish at the time. Their is a misconception that a sapphire with no heat is more valuable than a sapphire with heat "Natural only". If you took two identical sapphires in cut, clarity and color and then heat one sapphire with " natural gentle heat only " then left the second sapphire as a unheated stone - If the clarity and color of the natural sapphire improved after heated with natural heat the sapphire which is now a "Naturally heated " would become more valuable than the sapphire which was left with out heat. The sapphire on the left is a 3.25 ct natural sapphire oval cut with no heat, the sapphire on the right is a natural 3.05 ct sapphire with natural gentle heat only. As the color on the sapphire with "Natural heat only" has improved in clarity as well as color the value of this sapphire is higher than the sapphire on the left with no heat.. Up to 80% of a sapphires value is based on color alone. Sapphires which have being treated with natural heat only is a permanent treatment, it will not fade crack or come off,even if the sapphire needs to be re-polished or cut will never change the color of the sapphire. The care of a sapphire whether the sapphire is heated or with no heat is the same as a diamond, sapphires are extremely hard second only to the diamond in harness. 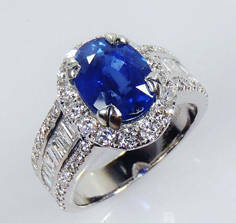 Sapphire Ring Co will only sell 100% natural sapphires with no heat or gentle natural heat only. Naturally heating a sapphire at low temperature’s has been a process which dates back thousands of years and helps improve the sapphires clarity and sometimes color. We always disclose this treatment and this is the " ONLY " treatment where a sapphire retains its high value. Natural Gentle heat "only" is regarded as the only treatment both buy Jewelers,Gemologist as well as the National Gem Association.